Katie Lohmiller with husband Jason and fraternal twins Marley (left) and Tate. Lohmiller participated in a pilot study of an app developed at CU to help post-partum women manage their weight safely. A little more than two years ago, Katie Lohmiller and her husband, Jason, got an early Christmas present: a baby girl and boy, Marley and Tate, who arrived on Christmas Eve, 2015 at UCHealth University of Colorado Hospital. The babies were healthy and so was Katie, but the birth delivered a nagging worry many new mothers share: how to shed the weight – about 45 pounds – she had gained during her pregnancy? 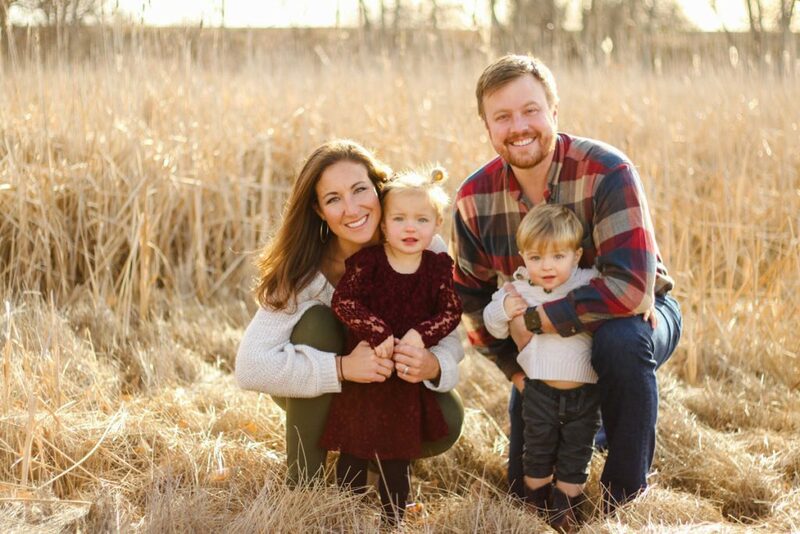 “I felt I was on track with my weight before having kids, but I felt nervous about getting back to where I was,” said Lohmiller, now 33, of Denver. She got some help from that fixture of the modern world, her smartphone. During her prenatal visits at UCH, Lohmiller signed up to be a candidate for studies related to pregnancy. 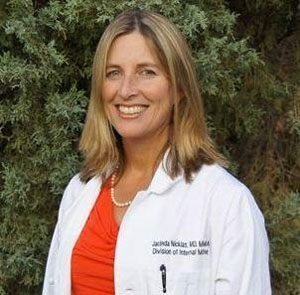 After she delivered, she was recruited for a research study led by Dr. Jacinda Nicklas, an internal medicine specialist with the University of Colorado School of Medicine. The goal: use mobile technology to help new moms lose post-partum weight and establish healthy habits to keep it off. Lohmiller joined the four-week pilot study, receiving a Fitbit to help her keep track of her weight, physical activity, diet and other measures of health. In addition, her phone regularly buzzed with health-related information delivered through an app Nicklas worked with clinical and tech colleagues to develop. If Lohmiller needed a human voice to supplement the information from her Fitbit and phone, she had one in the form of a health coach she could call, email or text. Dr. Jacinda Nicklas leads the Fit after Baby trial, which is testing the effectiveness of mobile technology in encouraging women to lose weight and follow healthy behaviors after pregnancy. The combination of electronic and human support was effective, Lohmiller said. Having twins, she’d especially worried about balancing the need to lose weight with supplying the twins with enough calories while she nursed. The pilot study led to a one-time focus group with Lohmiller and other participants who gave Nicklas feedback for her next step, which is now underway. The Fit after Baby study builds on the principles of the pilot, but with more features in the app, created with Comprendo, a developer of cloud-based digital platforms based in Santa Barbara, Calif.
A team of physicians and public health experts developed the content, Nicklas said. For example, Sheana Bull and Jenn Lieferman, both of the Colorado School of Public Health’s Department of Health and Behavioral Sciences, contributed to integrating behavioral theory and content into the app – a key to Comprendo creating a tool that women will use. 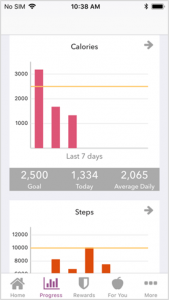 Bull also directs the department’s mHealth Impact Laboratory, which works to bridge technology to end users looking for apps that can help them manage and improve their health. The Fit after Baby trial aims at more than encouraging weight loss. It might be thought of as electronically aided early risk-reduction intervention. It targets women diagnosed with gestational diabetes, gestational hypertension, or pre-eclampsia – a combination of hypertension and elevated levels of protein in urine, an indication of kidney damage – as well as those who deliver infants who are preterm (32 to 37 weeks) or small (less than the 10th percentile for their age). All of these factors are linked to increasing women’s risk for diabetes, hypertension and heart attack after pregnancy. Women in the Fit after Baby trial download an app built by Comprendo, in collaboration with Nicklas and her clinical colleagues. The app delivers custom content to the women’s smartphones and enables them to keep track of key measures, like their calorie consumption and activity. Safely losing post-partum weight could help to lessen the danger, Nicklas said, but many women need help and support. “If they don’t lose the weight in the first six to 12 months, they tend to retain it,” she said. “The first year is the critical window for taking off the baby weight. We haven’t been addressing that early enough.” Nicklas also noted that shedding post-partum weight also decreases a woman’s risk for developing gestational diabetes and hypertension in future pregnancies. Enter the app, which delivers health-related content to the study group via their iPhones or iPods (it’s not yet available for Android devices). Comprendo provides the platform that enables clinicians like Nicklas to create and deliver customized content, or “health pathways,” through patients’ smartphones, said the company’s president and CEO Dean Hovey. When a new mom enrolled in the Fit after Baby trial downloads the app interface to her phone, she receives the pathway content stored on the cloud. In turn, when she interacts with the app – recording her activity or what she’s eaten, for example – the data flows back to the cloud, where a coach can review it and provide encouragement to the mom or make suggestions for improvement. As the trial progresses, moms receive new content, interact with the app, and the cycle continues, Hovey explained. “What makes these interactions so powerful is the system is continuously accumulating data and learning what interactions —what we call nudges — are most helpful to support the desired behaviors and outcomes,” Hovey said in an email. The control group will receive general information about healthy behaviors through text messages two or three times a week. Both groups will have their weight, waist circumference and a battery of blood labs measured at baseline, six months and 12 months to assess the results. The two approaches are very different, Nicklas said. For example, the study group receives daily content structured around weekly themes, such as controlling saturated fats in the diet. The content includes quizzes, educational resources and rewards for meeting goals, while wrist-worn Fitbit Flex 2s help women track their progress with activity, diet, sleep and weight and feeds the data back to the app. The app also addresses strategies to reduce stress – a yoga curriculum includes new poses delivered twice a week – and points women to resources to confront depression. Meanwhile, Kristen Frie, a registered dietitian and nutritionist, monitors and tracks each woman’s progress and coaches those who need it by phone or electronically. For many women, losing weight after giving birth requires more than mere willpower, Frie said in an email. Many of them face not only the considerable challenge of caring for an infant – or more than one – but also meeting the needs of their larger family, getting back to work, and so on. “Life is busy, especially with a newborn. I receive many questions about finding that appropriate balance and adequate energy to spend time with their family, while eating well and fitting in exercise,” Frie said. The new app provides plenty of information and suggestions for losing weight safely. However, Frie said her role is not to lecture women about what they should do but rather to reinforce and encourage their successes and to help them find intrinsic reasons for making healthy choices. “The core of behavior change is identifying internal motivation to make the changes, so I use motivational interviewing techniques with the participants to try and understand what motivates them and build from that,” she said. Those conversations can help change the point of view of women who might be reluctant to spend time on themselves, Nicklas said. 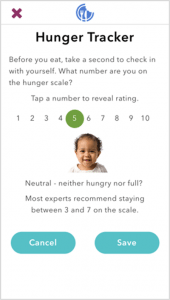 The app helps women stay aware of their hunger – an important part of managing their diet. The Fit after Baby study is a companion of sorts to the BABI2 (Balance after Baby Intervention for Women with Recent Gestational Diabetes) study, in which Nicklas is collaborating with Ellen Seely, MD, of Brigham and Women’s Hospital in Boston. That study aims to help post-partum women lose weight to decrease their risk of Type 2 diabetes. Women also have access to a “lifestyle coach,” but they get additional information and resources from a website rather than through an app. That study follows a 2012 pilot trial of the concept that Nicklas participated in with Seely as a fellow at Harvard Medical School. The two were co-authors of a 2014 Obstetrics & Gynecology article detailing the findings of the pilot, which concluded that a “web-based lifestyle modification program” decreased weight retention in women recently diagnosed with gestational diabetes. Pushing similar information to women through a mobile device app seemed the next logical step for Nicklas. But the most important measure of success will be how it serves patients. Three years ago, there were an estimated 165,000 mobile health apps available for download, but only about 1 in 10 accounted for 90 percent of the downloads. Two years later, the number of apps doubled, but the question of how many can demonstrate value to patients has yet to be answered. 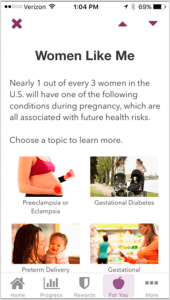 Content about prenatal and post-partum risk factors arrive to women’s phones via the app. For that reason, Nicklas said she and her colleagues will rely heavily on feedback from the Fit after Baby study participants. “They will be helping us to figure what will help women,” she said. Katie Lohmiller, who is currently finishing up her doctorate in public health, is glad to see the pilot study she joined continuing as a larger trial. She said that by the kids’ first birthday, she had returned to her pre-pregnancy weight – and she gives the smartphone technology a bit of credit for that. The Fit after Baby study is now recruiting. For more information, contact Danielle Cook at 303-724-8998/Danielle.Cook@ucdenver.edu or Jacinda Nicklas Jacinda.Nicklas@ucdenver.edu.